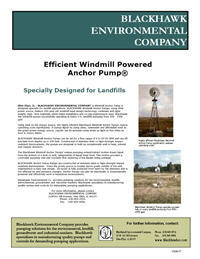 Blackhawk Environmental Company's Windmill Anchor Pump is designed specially for landfill applications. BLACKHAWK Windmill Anchor Pumps, using wind power source, feature 100-year-old windmill head design technology combined with lightweight, high–tech materials which make installation and on-site maintenance easy. Blackhawk has windmill pumps successfully operating in many U.S. landfills pumping from 500 - 1500 gpd. 21 W 161 Hill Ave.